I am very glad at this point to emphasize on the very sacrosanct self-determination event coming up soon, The Biafra Referendum. Millions of people, Biafrans and other lovers of freedom all over the world are eagerly waiting to hear the announcement of the date for this very important event in Biafra land because of the high degree of sufferings and enslavement of the people of Biafra by the Fulani Jihadist government of the contraption called Nigeria, indeed everyone has lost his or her last Chunk of hope and the only alternative to death being the restoration of the sovereign State of Biafra, surely BIAFRA is the only thing left in the minds of the people of the old Eastern Region. There is a basic fact about the quest for the restoration of Biafra and that is the existence of two opposing forces, the forces against the restoration of Biafra and the forces for the restoration of Biafra. To the forces against, It has not been easy to let go of Biafra even when it is obvious on every new day that Biafra must be restored and of course is already being restored, these enemy forces have applied so many inhuman, unethical and unconstitutional strategies such as illegal arrests and unlawful detention of IPOB members, killing, maiming and abduction of innocent people including women and children, blatant disregard for court orders and rule of law, suppression and witch-hunting of opposition voices, illegal invasion of the native residence of the leader of the Indigenous people of Biafra IPOB Prince Onyendu Mazi Nnamdi Kanu, intimidations and harassment of legal Representatives and Counsels to the Indigenous people of Biafra and most shamefully the illegal proscription of IPOB(a very peaceful freedom fighting movement recognised in the whole world as such) as a terrorist organization just to bring down the efforts being made for the restoration of Biafra nation. In all these evils meted against the struggle, the perpetrators have always successfully gained shame and disgrace as well as disapproval from the international scene, they have also succeeded in lending strength to the Indigenous people of BIAFRA as well as enhancing the global announcement of the struggle for the restoration of Biafra. Every attack on IPOB and its leadership ends up bringing in more sympathizers and volunteers to join IPOB. I am yet to unravel the mystery behind the PRO forces archievements which have remained unprecedented in the history of freedom fighting the whole world, without firing a shot but just upholding the truth and courage to stand fearlessly before the enemy. IPOB has destroyed the evil British empire called Nigeria. In view of the forgoing, all the principal actor-forces against the emergence of Biafra have undoubtedly known that they have lost the battle but their greatest challenge now is how to defeat ego and shame that are clothed in worthless pride, which is the reason Nnamdi Kanu and the leadership of IPOB having obtained the mandate of the Biafran people through the mock referendum (Sit-at-home exercises of 30th May 2017 and that of 2018) have formally requested for a date for the Biafran people to decide through ballots on whether to still remain in Nigeria or go away as an independent nation, that is a call for BIAFRA referendum. IPOB has proposed this honorable approach in order to accommodate the weakness of the government of Nigeria which is made manifest in pride and stubbornness. Indeed announcing a referendum would be a very perfect way of avoiding the calamity that will soon becloud the geographical concoction called Nigeria. 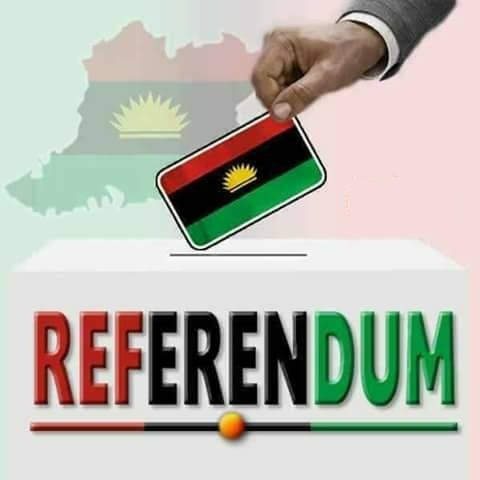 The fact that Biafra must be restored makes it very necessary to conduct this referendum and the fact that it is "referendum" and not "restructuring" makes it very shameful to those who are saying no to it and the fact it must be done shows our strength. It is Biafra or Death.